In recent history, the discussion of the best doubles team in crokinole was centred around 2 teams. While Conrad & (insert partner) consistently had impressive performances, the solidified partnerships of Ray and Jason Beierling, and Fred and Justin Slater, have by far the best resumes. And as they did in 2014 and 2016, these two distinguished teams met in the final to determine the Ontario Doubles Champions. 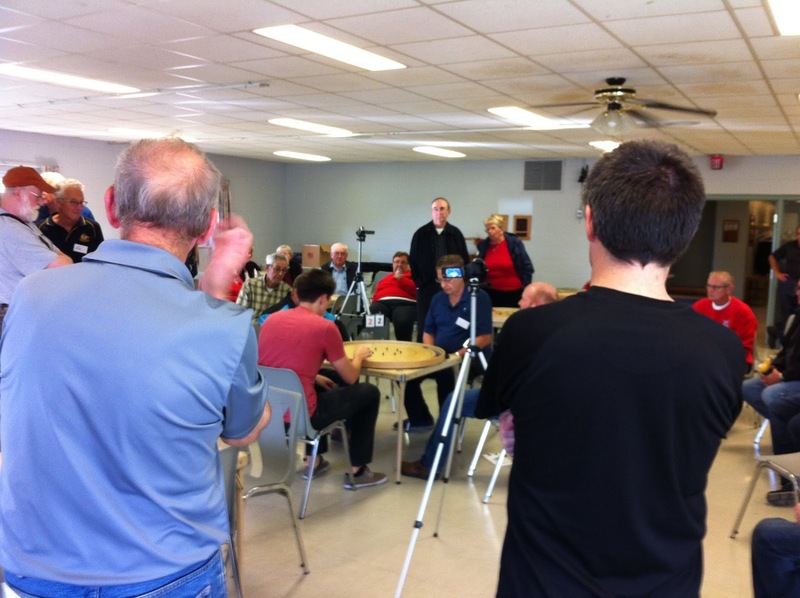 The Brucefield United Church hosted the provincial event, which featured a record-tying attendance of 58 players, with 14 competitive teams and 15 recreational doubles teams. The competitive doubles teams played a full round robin of 13 games, with the first 7 games taking place in the morning. 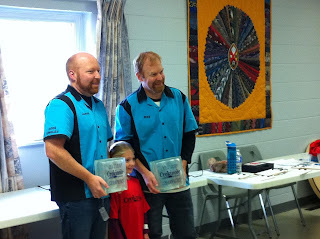 Roy Campbell and Jeremy Tracey, fresh off a 2nd place World Championship finish, had the best start, scoring 44 points, and they were followed closely by the Beierling’s at 40 points. Sitting tied for 3rd at the halfway point were Connor Reinman/Andrew Hutchinson and Cor Vanden Hoven/Ron Reesor, both at 36 points. Sitting 4 points back of the playoff spots were the teams of Justin Slater/Fred Slater, Clare Kuepfer/Neil Cook, and Dwayne Campbell/Christina Campbell, who all had 32 points looking to gain ground in the afternoon. Also not too far out of the playoff mix were the brother teams of Reid Tracey/Nolan Tracey and Tom Johnston/Rex Johnston, who were tied for 8th at 30 points. In the afternoon the Recreational division had been split top-half/bottom-half based on the morning performance. In the B division, the team of Eileen Bell and Wayne Bell, and Carmen Hodgkinson and Evelyn Hodgkinson scored well with 27 and 30 points respectively, but neither was enough to make it into the finals. Doreen Sulkye and Marilyn Thompson earned the top seed with 34 points, while the tournament-debut of Garret Tracey and Ernie Lightfoot led to the second seed at 31 points. In the “first to 9 points” final, Sulkye and Thompson used the hammer advantage to scrap out a narrow 10-8 victory. 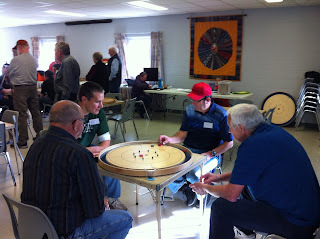 In the Recreational A division, several new partnerships led to high scores with Peter Carter and Perry Carter scoring 33 points for 3rd place, while Ron Langill and John Lichty scored 36 points for 2nd. Meanwhile, the Vanden Hovens, Rich and Tony, finished 1st with 39 points to claim the other spot in the final. While not as thrilling as the 10-8 finish in the B division, the final had its moments of excitement before Rich Vanden Hoven and Tony Vanden Hoven won the match. In the competition division, the Slaters had the strongest afternoon with 37 points in 6 games, propelling them up to 3rd place and a spot in the semifinals. The Beierlings scored 34 points to Campbell/Tracey’s 30 points, leading to a tie for 1st at 74 points. The Beierlings earned the first seed by way of head-to-head tiebreaker. Connor Reinman and Andrew Hutchinson finished with 32 points in the afternoon, for a total of 68 points and the 4th seed for the semifinals. Missing the playoffs, that left Reesor/Vanden Hoven in 5th place as they totalled 64 points, and Kuepfer/Cook in 6th place as they finished with 60 points. The only non-constant between the two years was the partner of Reinman, which was Nathan Walsh in 2017 (who partnered with Gloria Walsh in 2018), now swapped out for Andrew Hutchinson (who needed a new partner to substitute for the vacationing Jon Conrad). Curiously the similarities continued in the Slater/Slater v Campbell/Tracey semifinal. Just as in 2017, the 2018 match began with Campbell/Tracey holding their first hammer for a 2-0 lead, which was followed by Slater/Slater winning the next 8 points for an 8-2 lead in the “first to 9” match. The 2018 match saw the Slaters gain early leads in nearly every round, forcing their opponents to make tough shots to come back. What was somewhat unusual for the aggressive, creative and shot-making pair of Campbell/Tracey, was that they struggled to score takeout-20s in those rounds to level the score. The Slaters held their hammer and won the 6th round of the match to make the Ontario final for the 3rd straight year. In Reinman’s 2017 semifinal with the Beierlings, he and Walsh were able to sweep the match 10-0, and Reinman began the 2018 semifinal in that direction as he and Hutchinson (both choosing to sport University of Michigan sweaters on the day) made it 2-0 against the hammer. Reinman/Hutchinson had the edge in the 2nd round as well, but the turning point was when Jason Beierling protracted a disc into the 20 from the farthest edge of the board (so far that they needed a flash light measure), on the way to winning the round for 2-2. The following rounds fed into the bread-and-butter of Ray Beierling’s game with many Open 20s scored that all favoured the Beierlings on their way to an 8-2 lead. In the 6th round, the Beierlings just needing one more point, left their final disc hidden beyond the pegs on the far side of the board. Hutchinson, needing a takeout and stick, took a good amount of time to compose himself and successfully made the shot for 8-4. Down early in the 7th round, Hutchinson scored an amazing ricochet and peg-rub 20 (the star shot on what was one of many terrific shots for Hutchinson in the match; the full video for that one is going to be great). However, the Beierlings stayed extremely well focussed and made every Open 20 they needed to close out the match 10-4. 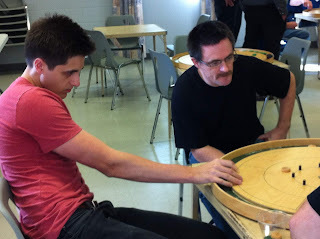 And so the final was set for Slater/Slater v Beierling/Beierling, with the winner to earn another point in their favour for who is the best doubles team in crokinole. Both teams have had strong recent performances at the World Championships, with the Slaters winning 3 times and finishing in the top 4 5 times since 2012. While the Beierlings have made the top 4 at the World Championships every year since 2013, and picked up the 2018 title. At the ODCC, the Slaters three prior appearances resulted in 2 2nds, and one victory, to go along with what was now their 4th overall, and 3rd straight finals appearance. For the Beierlings, now all 9 years of the ODCC resulted in top 4 finishes, with 4 victories, and 2018 being their 7th trip to the finals. It’s only fair in this “best team in recent history” discussion to mention Tony Snyder and Jon Conrad, who have 2 wins and a 2nd place finish at the WCC, along with a 2nd and 3rd place from the ODCC. And, while stretching the definition of “recent history” it would be thorough to mention the team of Fred Slater and Brian Cook, who went a perfect 3 for 3 in ODCC appearances, and even added a provincial British Columbia doubles title to their record. Getting back to the 2018 championship match, it was the third head-to-head finals match of Beierlings v Slaters, with the Beierlings winning 2014, and the Slaters in 2016 (apparently Jason Beierling was breaking down video footage of the 2016 match the prior evening). The first two rounds of the “first to 11 points” final went against the hammer. Lots of 20s were scored in the 3rd round, but Ray Beierling’s follow through 20 that bounced off a peg was decisive as the Beierlings held their hammer for 4-2. The 4th round saw lots of interesting positional shots and discussion, including lots of whispering from a large and engaged crowd that stuck around to watch the final. The Beierlings had an extra 20, but the Slaters had 2 discs on the board. Jason’s final takeout and roll attempt lost the shooter, leaving a Slater 5 and an open board for Justin on the final shot. He’d just missed for a 15, tying the round; 5-3 for the Beierlings. The Slaters would make it 5-5, and despite being down in the 20 count, put on significant pressure. Twice Justin left discs perfectly next to the peg forcing Ray to just tap. Justin Slater then scored a follow through 20 that would narrow the gap enough for the Slaters to tie the round and make the match 6-6. Interesting strategy choices and execution errors were the themes of the 7th and 8th rounds. The Beierlings missed a a tap-up-assist play in the 7th round that took the pressure off the Slaters, as they led 8-6. But in the 8th round, Fred Slater’s attempt to spoil a hangar 20 chance for the opponents, led to him removing all of his discs on the board. Once Jason Beierling scored the crucial open 20 on the next shot, the Beierlings were well on their way to 8-8. After making it 10-8, the Beierlings were only one point away from the title and secured an early lead in the 10th round. 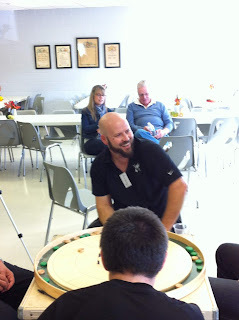 They then used some great disc placement to prevent a comeback, and took the Ontario Doubles Crokinole Championship 12-8. 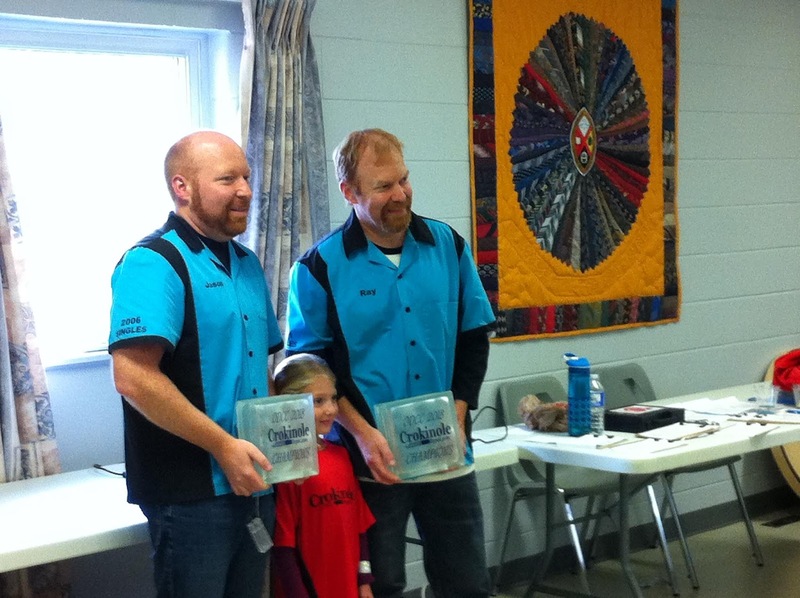 With the win, Ray and Jason Beierling tie Fred Slater’s record with 4 Ontario Doubles titles. Also, 2018 marks the 3rd straight year that the Doubles World Champion(s) have went on to win the Ontario Doubles tournament immediately after (Slaters in 2016, Nathan Walsh in 2017, Beierling in 2018). The victory and tournament results are also significant for the NCA Tour. Justin Slater now has 197 points (3 victories and a 2nd place finish), followed by Jason Beierling at 190 (2 victories, 2nd, 4th) and Ray Beierling at 184 (2 victories, 3rd, 7th). Roy Campbell and Andrew Hutchinson are currently rounding out the top 5 on the Tour, with the next stop being the 2017 Scenic City Crokinole Classic in Owen Sound on November 24th. The 2018 calendar year has been one of Justin Slater’s best, which is saying something for a player of his calibre and resume. Coming into Belleville, Slater had won the singles events in Hamilton, London, St. Jacobs, the World Championships, and Turtle Island: 5 victories in 6 events. The single blemish being a 2nd place finish in Kitchener at the Joseph Schneider Haus event. The winner of that event, by just one single point over Slater, was Jason Beierling, and the two would meet again in the finals of the 2018 Belleville Crokinole Challenge. 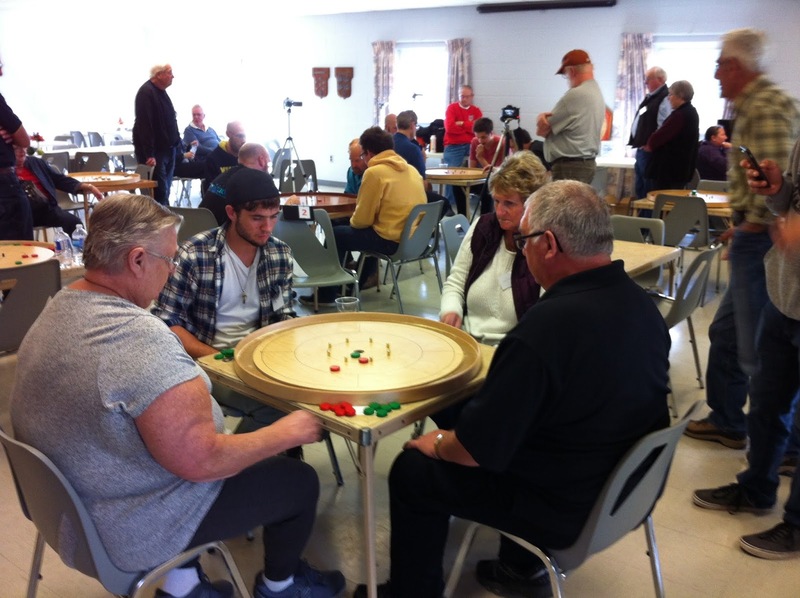 The Quinte Region Crokinole Club (QRCC) welcomed 38 players from Kingston, Oshawa, Toronto, Kitchener, London, Owen Sound, Hamilton and Penetanguishene. Chris Gorsline opened up the day with some scripted comments on rules and tournament format, mixed in with off-the-cuff humour, and then play began. Fred Slater led all morning scores with 62 points and 91 20s in 10 games, with Nathan Walsh finishing 2nd with 61 points, and Justin Slater finishing 3rd with an adjusted 10-game score of 60 points (by virtue of the rotation some players only played 9 games, Slater scored 54 points in those 9 games). The top 20 score of the morning round came from Roger Vaillancourt who scored 98 20s through 9 games (equivalent to 109 20s through 10 games). 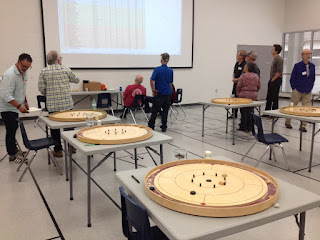 The top 13 scores from the morning advanced to Pool A for the afternoon, which included several NCA-regulars with a long resume of crokinole success, and tournament rookies Tim Burgess and John Wood, who made a strong impression and quickly became players to watch out for. Also making the afternoon A pool were the Tracey trio (Jeremy, Reid and Nolan), which was impressive considering all 3 were placed into the same pool in the morning round. John McFeeters, Peter Tarle and Shirley Sager just missed the Pool A cutoff (McFeeters by 2 points, Tarle and Sager by 3), while Clare Kuepfer grabbed the 13th and final spot in Pool A with 48 points in 10 games. The cutoff for Pool B also saw a couple players just missing out with Jo-Ann Carter earning the final spot with 36 points in 10 games, beating out Barrie Wood by 2 points, and Dave Brown by 3 points. In the afternoon, Pool C was led by Len Chard at 51 points and 63 20s in 9 games. Bob Leggett grabbed the 2nd seed with 49 points, Peter Klaassen was 3rd with 45 points, and tournament rookie Maradyn Wood earned the final playoff spot with 43.2 points (48 points in 10 games, adjusted down to 9). For the second time in the day, Dave Brown just missed the cutoff, finishing 5th with 39 points. In Pool B, it was Eric Miltenburg, playing for the first time representing the flag of the Quinte Club, earning the top seed with 53 points in 10 games. Peter Tarle was second with 51 points and a group-high 78 20s, with Chris Gorsline closely behind at 49 points. And the final semifinal spot was earned by John McFeeters at 43 points, edging out the 41 points of Brian Miltenburg. The A pool was led by Jason Beierling, who scored 51 points in 9 games (adjust to 56.7 points in 10 games), followed by Justin Slater at 53 points. Andrew Hutchinson scored 43 points in 9 games (equivalent to 47.77 over 10 games), while Nathan Walsh earned the 4th seed with 47 points. The 5th and 6th place spots were close behind with Jeremy Tracey at a 10-game adjusted score of 45.55 points, and Fred Slater at 45 points. The 20s scores were somewhat incredible in Pool A with Walsh scoring 115 20s, including his 2nd perfect round of the tournament, but that was only the 3rd highest 20 score in the pool. Ray Beierling, who finished 7th, scored 105 20s in 9 games, which normalizes to 117 20s in 10 games, and Jason Beierling scored 118 20s in 9 games, which translates to a huge 131 20s. Truly some fantastic 20s scores for being very early in the crokinole season. The Quinte playoff format is a best 2 out of 3 games, but each game only plays a maximum of 4 rounds, meaning it is possible for a game to end in a tie at 4-4. If after 3 games the players are tied (either by drawing all 3 games 4-4, or by drawing one game 4-4 and each winning one of the other 2 games), the match proceeds to the Quinte Convention tiebreaker. The tiebreaker involves pairs of 2 rounds being played, so each player has the hammer once. If, after a pair of rounds is completed, the score is either 3-1 or 4-0, the match is over. If the score is 2-2, then another pair of 2 rounds is played. 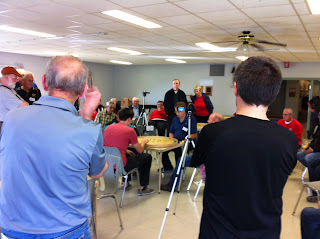 A maximum of 4 pairs of rounds (a total of 8 extra rounds) is played, and if still tied the match ends via a 20 shootout (which has yet to be required in the history of the Quinte Convention). In the C Pool semifinals, Len Chard progressed 6-2, 6-0 against Maradyn Wood, while Peter Klaassen defeated Bob Leggett 6-0, 5-3. In the finals, Len Chard emerged victorious, winning 4-4, 6-2, 4-4 over Klaassen. In Pool B, Peter Tarle defeated Chris Gorsline 5-1, 6-2, while Eric Miltenburg and John McFeeters required the Quinte Convention to determine a winner. McFeeters won the first game 5-3 and led 4-0 in game 2, before Miltenburg staved off elimination by winning the next 4 points to tie game 2 4-4, and then send the match to extra rounds with a 6-2 game 3 win. Miltenburg prevailed in the first set of extra rounds 4-0 to make the final. Peter Tarle won the final match by a score of 4-4, 6-2, 4-2 (having already secured the match by earning at least a tie in the 3rd game) to win Pool B and the Reg Chisholm Memorial trophy. The A Pool semifinals saw Andrew Hutchinson and Justin Slater facing off in a rematch of their Turtle Island semifinal from one month ago, while Jason Beierling and Nathan Walsh played each for the first time in a singles playoff encounter. Hutchinson and Slater played a brilliantly tied match, with Hutchinson winning game one 6-2, and Slater winning game two by the same score. In game 3, Hutchinson won the first 2 points against the hammer, only to have Slater return the favour and then lead 4-2 threatening to take the match. But Hutchinson pulled out the final round to tie it 4-4. The first pair of extra rounds was split 2-2, before Slater won the final pair 4-0 to make the final. In the other semifinal, it looked like one-way traffic for a while with Walsh leading 5-1, 4-0, but Jason Beierling came back from the brink to make game 2 4-4. Walsh then won the first round of game 3, and needing only a 3rd game tie, was 2 points from the finals. But again Beierling fought back, winning the next 3 rounds to take game 3 6-2, and then winning first set of extra rounds to make the final (5 rounds "on the trot" as they would say in England). It was Jason Beierling’s and Justin Slater’s first meeting in a singles final, with their last playoff meeting being the St. Jacobs semifinal won 10-6 by Slater. Game 1 saw both players play their first hammer rounds solidly for a score of 2-2, and then saw both players trade costly errors leading to 2 steals for a 4-4 tie to game 1. In game 2, Slater was very opportunistic and converted each of the few hangar 20 opportunities that were left to him, and after a steal and 2 hammer holds, Slater had won game 2 6-0. The tension built in game 3, with Beierling accumulating a couple of discs on the board following Slater errors. Slater scored a touch-20 and was rewarded when Beierling’s open 20 shot slipped through the house. However, only up one 20, Slater faced two opposing discs on his final shot. After a long analysis Slater’s shot resulted in only a single-takeout and a missed 20. Beierling made the successful hit and stick to lead 2-0. Round 2 was more structured with Beierling missing an early 20 and Slater comfortably maintaining the lead throughout the round to make it 2-2. Beierling, now facing elimination, won the 3rd round in a similar fashion with superior 20 scoring even when facing pressure after Slater scored a touch 20 to take what was a temporary 20 lead. In the fourth round, Slater needing 2 points to win the title, Beierling missed his first open 20, but immediately scored a follow-through 20 to get back on track. Slater answered strongly with a couple open 20s until Beierling missed short on his 4th shot and was again looking for takeout-20 opportunities. One came later on this 6th shot when he expertly took out a disc in-between the pegs and had his shooter rebound perfectly off the peg into the 20 hole. But again, Slater scored the open 20, prompting Jason to recall a popular Jon Conrad quip, “counts as much as that.” Beierling would leave a hangar on his 7th shot, which Slater scored for a 20 to clinch the match and the Belleville title 4-4, 6-0, 4-4. With the results of Belleville in the books and the Ontario Doubles Championships coming up soon, the NCA Tour standings already seem to be taking shape. Justin Slater is out to a big lead with 3 victories and 188 points, while Ray Beierling is 2nd with 172 points. Jason Beierling only has 3 events scored in his rankings at the moment, but sits second in points average with 46.7.